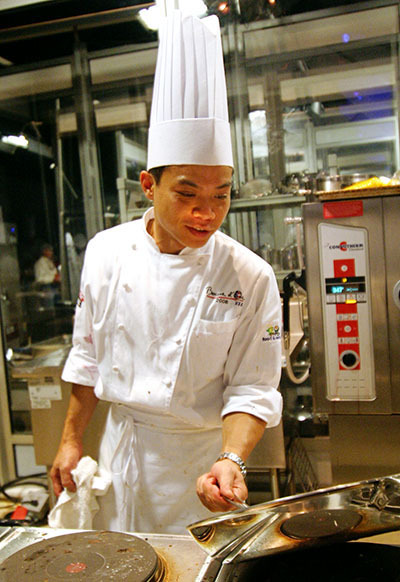 Chef Hung was selected as one of the eight competitors for the Bocuse d'Or USA, to compete at Epcot, Walt Disney World, to represent the USA in the international Bocuse d'Or competition in Lyon, France, in January 2009. During a question and answer session, Chef Hung mentioned the difficulty he had in preparing for competition, as Solo's kitchen is strictly kosher, which made practice for Bocuse nearly impossible. Nevertheless, he brought everything he had to the competition. Foodbuzz was kind enough to send Christey and me to the Bocuse d'Or as part of their Foodie Correspondent Program, to write about and photograph the competition. This interview is our second post about our experience. Chef Hung graciously agreed to speak with me during the cocktail reception, before the gala dinner where the winner was announced. He had started cooking at 8:30 that morning, and finished his dishes at 2:10pm. Peter Krause, fotocuisine.com/Foodbuzz.com: So, Top Chef -- that was six weeks? Chef Hung Huynh: Yeah, of shooting. Every day. Hung: Yeah, I didn't! Barely. Peter: ...so what is the pressure like on this, as opposed to Top Chef? Hung: Here, I was actually a lot more calm than on Top Chef. Hung: Calmer, yeah, but I definitely wanted to please all these great chefs here, but I knew I could definitely cook wherever I wanted, make it taste good here. Peter: ...the presentation of course was absolutely beautiful. Hung: Ah, I wish it could have been better, it could have been a lot better, but you know, given the situation, I'm happy with it. Hung: Oh yeah, but for me, flavor is first, which is why I didn't do a lot of decoration on the top of the food for no reason -- Does it belong there? Do you really need it there? That's my mentality: No you don't. It looks great, but I did what I wanted to do. Peter: Well, the potatoes wrapped on the outside of the beef, that was really pretty. Hung: Yeah, that was good (grins) I liked that, it turned out better than I expected it. Peter: Your pattern on top of the cod was a pretty classical pattern with the truffles, I mean, I assume that had a lot to do with your presentation ideas? Peter: It looks like the tile pattern on the floor of a hotel in Paris, 1920s, I mean, really pretty! Peter: The popularity of Top Chef, Iron Chef, both Iron Chefs, I mean, reality shows are reality shows, but the quality of the food has been getting better. America is definitely developing a palate in the last few years, have these reality shows helped the trend? Hung: Oh, they're definitely helping, they're reaching out to people who don't normally cook, or people who just never got into food. Reality, it's popular... so, people who would not normally watch cooking shows, because it's entertaining, they're more educated now, I think. They're much more educated now. They're much more exposed. Peter: Are you online at all? Do you have a food blog? Peter: I know you're a chef, you're busy, do you have a restaurant now after Top Chef? Hung: I'm working on it, in Manhattan, I'll learn a little more about it soon. Peter: Thanks, Chef, I appreciate taking time with us.